KARLSRUHE, Germany & IRVINE, Calif.--(BUSINESS WIRE)-- joimax®, the Germany-based market leader of technologies and training methods for full-endoscopic minimally-invasive spinal surgery, is well positioned for Germany’s principal spine convention, German Spine Society (DWG), taking place December 6 to 8 in Wiesbaden, Germany. 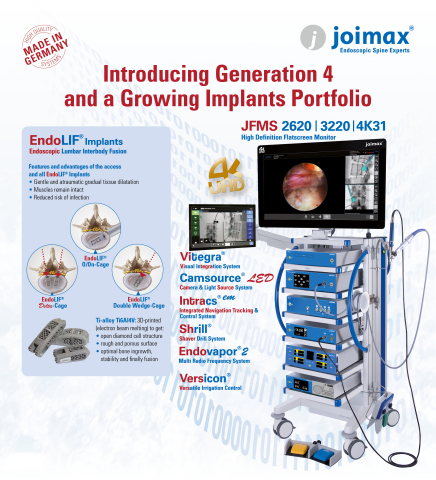 This year, joimax® is focusing on their Endoscopic Tower Generation 4 Devices, an expert solution for spinal surgery. They will showcase the new Camsource® LED, a fully integrated camera and light source system that delivers brilliant images up to 4K; and the Vitegra®, the integrated visualization, documentation and commanding device. This marks the global launch of both devices, including in Europe, Asia, and the United States. Moreover, joimax® will exhibit its EndoLIF® product line: the well-known 3D-printed EndoLIF® O/On-Cage, the EndoLIF® Delta Cage, and the EndoLIF® Double Wedge Cage (approval expected shortly). Additionally, joimax® will show Intracs® em, the first complete electromagnetic navigation system for endoscopic minimally invasive spine surgery. Intracs® is an easy to set up, user-friendly system that can serve as a stand-alone device. It relies on electromagnetic tracking and was designed specifically for simple and safe access to any spinal target. It’s the only device on the market that allows for simultaneous navigation of multiple instruments such as needles, guiding rods, reamers, and endoscopes, also developed by joimax®. Besides an expanded booth presence with daily Meet-the-Expert Sessions, joimax® will again host two lunch symposiums on endoscopic spinal procedures: one covering endoscopic pain therapy, and the other addressing diverse intracanal surgical treatment modalities, including endoscopic fusion. Press Contact USA: joimax® Inc.